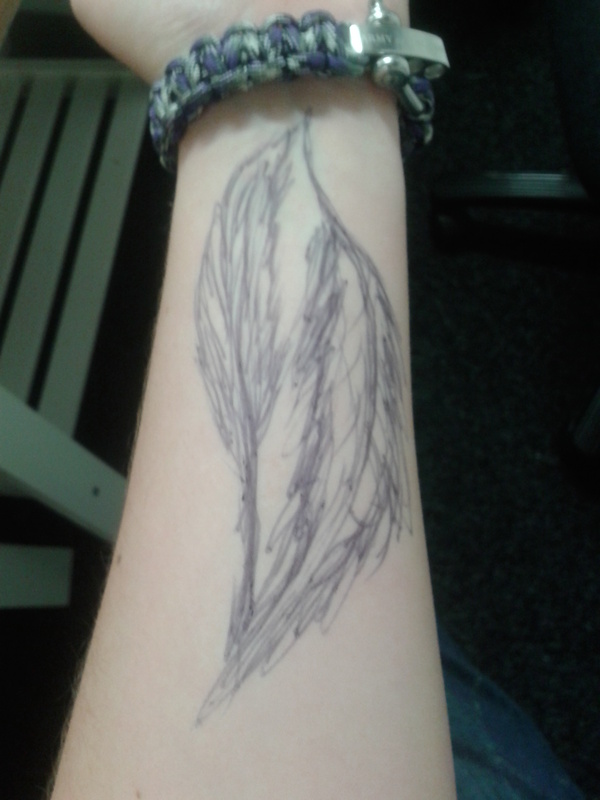 So, I got a bit bored of waiting for my house / course mate to finish his course work (as I had already finished mine for the day), I decided to draw a feather on my arm along with a second. Now, following on from my previous feather post, I think TWO of those, in this exact position would make a mighty fine tattoo design indeed. I also now have ideas to extend it, with the most cliché of all things…… birds flying out and up, towards my shoulder, to make a full blown sleeve. The colours, would still be watercolour / muted with pen and ink style mixed into the design. I can extend it gradually, if I so desire OR get the full blown thing. Lots and lots of decisions to make here. Obviously the tattoo artists will help me out, big time as to what to do. This week I am sadly moving out of halls. My fresher days are ending. I will obviously be uploading everything I make so stay tuned!!! !